Hello, friends! This week marks the beginning of our annual trip to visit family on the East Coast. We have a lot of flying and driving happening this week, so I’m not going to bother thinking about what we will be happening for dinner each night. I DO know we’ll be home tomorrow night and I have the ingredients to make lentil soup, so that is happening at the very least. TUESDAY – THE NEXT THREE WEEKS! – Annual East Coast Summer Trip! As usual, and especially now when I’m basically in vacation mode, we need your menus! Please share your weekly meal plans! Thank you all for your awesomeness! Hello, friends! I’ve been quiet on the blog and Facebook page this past week because, well, what a week it has been. I don’t even know what to say at this point except I’m doing what I can to amplify light in this world. Light is my focus. And love. We had a good weekend, away from phones and computers, with friends and family. And now, here it is, time to plan another menu. We have a quiet week this week, which the kids and I are both really looking forward to. I’m hoping it means we’ll have some time to cook together, too! My computer with my weekly menu files is acting up tonight, so I’ll get the PDF posted tomorrow. As usual, please share your wonderful menus in the comments! They really are such a help each week as I plan, and I’m sure it’s a help for many others, too! – 4th of July Cookout! – Visiting family in L.A.
You all know the drill…please share your menus in the comments! And have a wonderful 4th! Click here for this week’s printable PDF of the menu and shopping list! You know the drill around here…we want to know what you’re having for dinner this week! Please share in the comments! – Benihana with the kids – their end-of-school special dinner request! – The girls and I are camping again! The boys will find for themselves this weekend! That’s all she wrote! Some of you have already posted your menus…THANK YOU! Keep the menus coming! Hi friends! So, I’ve been a complete failure at making dinner lately. Seriously. There is just SO MUCH GOING ON these last few weeks of school. I call uncle. It is finally our last week of school and I’m just gonna see how it goes. Since it’s such a loosey-goosey menu, I’m not going to bother with the PDF! I am super excited for school to be over so that we have a bit of time to get back into a good food groove. You know the drill! Please share your menu for the week! Excited to see what you’ve got cooking! Hi friends. WHOAH. This past week just about did me in! I think this week will be pretty busy, too, but at least I’m getting to started off with a menu! And thank you all who posted menus last week. Everything on my menu this week is pulled from your menus! – Dinner at school open house! Now it’s your turn to share! Leave those weekly menu plans in the comments! THANK YOU! Hi friends! Okay, I have several carry-over items from last week’s menu because I never made it to the grocery store. KISS OF DEATH. This week is gonna be different! – Boys on their own! You know the drill…share those menus! I can’t tell you how grateful I am for each and every menu that is shared in the comments each and every week. You guys are the best! Hello, everyone! Last week was so nice. I got the grocery shopping done on the weekend and made dinner all week. I do have a couple carry over items from last week, which is also nice because I already have the ingredients! Hopefully this week will go as well! As usual, please pretty please share your menu plans for the week! Thank you and have a great week! It’s been a great Mother’s Day around here with a lot of lazing about for me, just the way I like it! 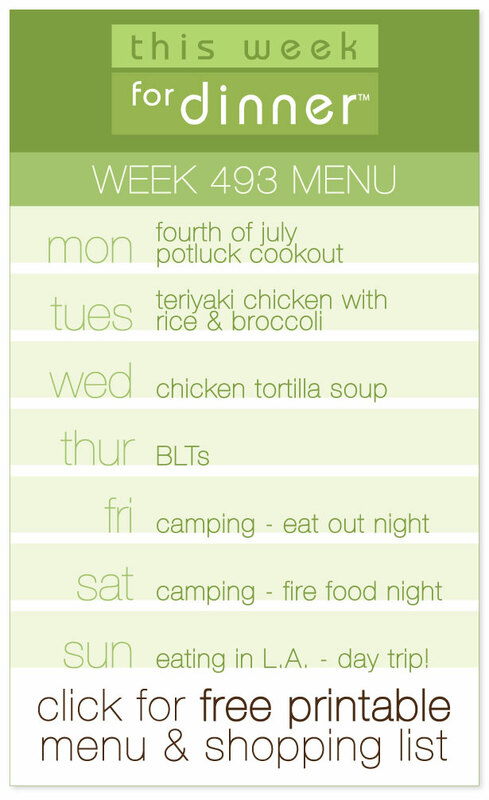 Luckily I planned my weekly menu yesterday so, throwing this together wasn’t a big deal today. I even have the grocery shopping done, yay! As usual, be sure to tell us in the comments what you have cooking this week! And Happy Mother’s Day to all the amazing women out there who influence the world for good!